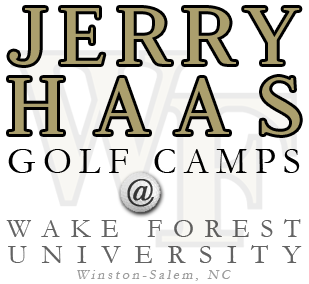 The Jerry Haas Summer Golf Camp gives young golfers, ages 11-18, a unique opportunity to live on a college campus and learn the game of golf from some of the best in the business. Coach Haas and a staff of COLLEGE COACHES serve as camp counselors and golf instructors during each session. Campers receive personal instruction covering everything from short game to the rules of golf. Play and practice are at the new Wake Forest state-of-the-art golf practice facility and at local courses. "Golf is a game of integrity, character and mental fortitude. When you leave our camp you'll not only be a better golfer but will have memories that will last forever." "I am looking forward to our time together this summer. You will not only be able to live as a Wake Forest student, but also learn lessons for a lifetime with me and our outstanding staff."